Dumfries & Galloway Family History Society is a volunteer run group. 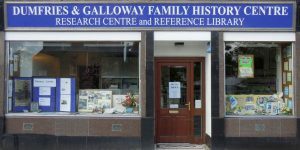 Established in 1987 we help and promote the study of family history. If you have any comments on the website or have any suggestions, please email webmaster@dgfhs.org.uk. At our AGM on 6th April The Society announced its affiliation with Findmypast. Details of this can be found on the Findmypast page under the RESOURCES menu and on Findmypast Benefit page under the Membership menu. 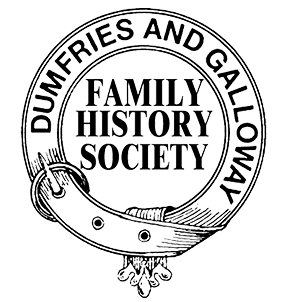 Dumfries & Galloway Family History Society covers the three counties of South West Scotland – Dumfriesshire, Kirkcudbrightshire and Wigtownshire. The Society was established in 1987. Our aim is to promote the study of family history and is run by volunteers. We do not contract to do research for others, we simply act as facilitators for researchers visiting our area who are doing their own research. Currently we have around 880 members world-wide. Our Newsletters, published three times a year, offer members the chance to publish interests and queries, allowing other members to offer assistance. We have a well resourced Research Centre in Dumfries with a library, microfilm and microfiche of Old Parochial Registers, Census data, newspaper indexes and much more. Most of our resources, but not all, are pre-1855 when statutory registration of Births, Deaths and Marriages was introduced in Scotland. The Research Centre is staffed by experienced volunteers who are usually able to offer advice on where to look next. We have free parking to the rear of the building and in the surrounding streets. We are just across the River Nith from Whitesands bus terminal and a fifteen minute walk from Dumfries railway station. If you are an Overseas visitor to our Centre in Dumfries with a small window for your visit, please contact us in good time about your preferred session and we will endeavour to make sure that the Centre is open for you. This you can do via researchcentre@dgfhs.org.uk.